Many of you have ask for a way to spread expense costs over several days. One typical use case for this is when you pay a price per night for a hotel. In that case you don’t want to create a single expense for all nights as that would mess up your daily average. But adding an expense for each day manually is pretty annoying. 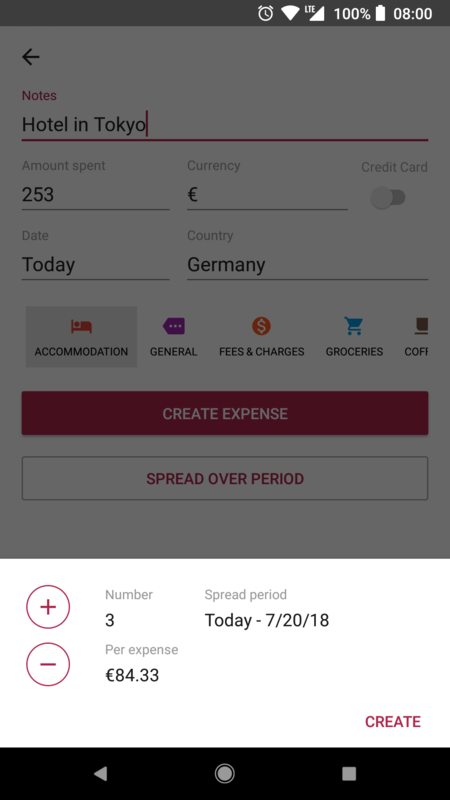 I’m thinking about extending this feature and adding the option to create a single expense but spread the cost out equally over the entire trip when calculating your daily average. This could be useful for bigger one-time purchases that you don’t want to split up into multiple expenses. I love this future. This indeed could be useful also if one has some costs BEFORE starting trip (as we did). We’re on 9month travel thru SE Asia and even before journey has started we’ve spent ~4k USD for insurance, some flights, electronic, etc. Now I’ve would like to spread those cost over all trip, as currently daily average has no use for me. Unfortunately I see no way for that. By the way - this is the best travel spending app I’ve used so far! Hey, thank you very much for your feedback. I would recommend to mark all those pre-trip expenses as “excluded from daily average” (in the three-dots-menu of the expense screen). This will reduce your daily budget accordingly by spreading the expenses over your total trip length. The only feedback I have for it is that it would be great to be able to update the group of expenses in one go. I.e. if the hotel cost (which is spread over multiple days) changes, you want to be able to change the rate for all those dates in one go instead of changing each entry individually. I’ve had that happen when I made a mistake in cost, type of expense and currency. So it goes beyond the $ amount. Hi Katerina, good news! It’s now possible to update spread expenses in one go.